Scotland prop Simon Berghan is relishing his return to Paris after "toughening up" under Edinburgh head coach Richard Cockerill. The New Zealand-born forward, 28, previously spoke about feeling "like a boy in a man's world" before his Test debut away to France in 2017. He is likely to retain his place for Saturday's Six Nations match in Paris. "Where I am in my career, they are the sort of challenges I need to be taking on and doing well in," Berghan said. "My first cap was away to France and it was a baptism of fire, but I enjoyed it. I was literally thrown in at the deep end, a scrum on the five-metre line was my first job. "I relish those challenges now. My first five or so games, I struggled with it, but now I am becoming comfortable. "It was the same with Edinburgh. Once you have a few games under your belt, you are more comfortable and settled." Berghan has won 16 caps since his debut at Stade de France two years ago and started in the victories over France and England in last season's Six Nations. 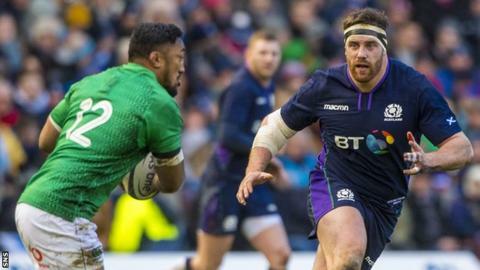 With Edinburgh team-mate WP Nel injured and Glasgow Warriors' Zander Fagerson just one match into his comeback from a broken ankle, Berghan is expected to retain his place in the starting line-up following the defeat by Ireland earlier this month. After allowing a promising half-time position to slip away to a disappointing defeat to the Irish, Berghan knows this Scotland team must start winning tight matches if they are to be ranked among the world's best. "Games like Ireland we can win; we forced a few errors and watching it back was disappointing," he added. "It's sharpening the knife to get these wins, we have all the foundations in place. We just need to go out there and finish it off. "The Six Nations is a short tournament and you need to win these games to finish up the table. A win would be a really great way to go into the England and Wales games."